High End Systems Intellaspot (EN) | PRO MUSIC, s.r.o. The intellaspot represents the next generation in innovative optics, providing high lumen output, energy efficiency, zoom range, and overall feature set — all at a highly economical price point. The fixture is a hard-edged moving yoke light featuring smooth CMY color mixing as well as variable CTO. A fixed color wheel allows instant color choices via easily exchangeable dichroic filters. Two rotating Lithopattern® wheels, each with seven patterns plus open, provide a large number of output patterns and images. The output can be further enhanced with a rotating prism and an animation wheel. 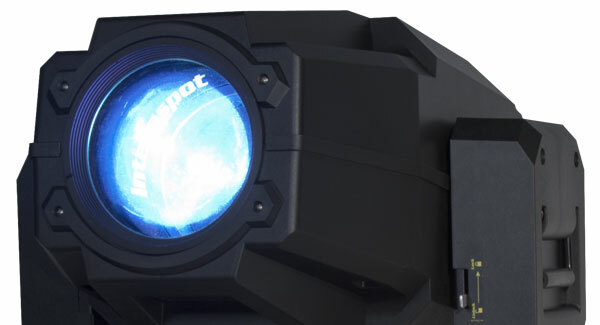 With a powerful optical system, the intellaspot not only produces an extreme 20,000 lumen output from the 850w HID lamp, but also provides clear projections with a large zoom range of 11° to 55°. With its fast mechanical iris, variable soft edge, and electronic strobing, the intellaspot is truly a full featured automated luminare. Built on an entirely new platform, the intellaspot combines new technologies to create an exceptionally energy-efficient fixture that conforms to modern “greening” principles. A battery-controlled full color LCD menu system enables fixture addressing without having to power up the unit. Low ambient noise, RDM, and extensive DMX capabilities make the intellaspot the professional choice for a wide variety of applications. 850w HID lamp – 750 hrs.